One of our regular readers and former editor of Hacks long ago George Olden asked me why I loved Inception so much – because clearly he had a major problem with it. It goes to the heart of why I love cinema so much, and why, quite often, I am so disappointed by it. 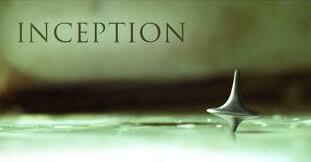 That said, I was never going to be disappointed by Inception. From the moment I saw a still, from the day I heard just a scintilla about it, I knew I was going to love it. It’s chemistry. Some films are just right and you know it will push all the right buttons. It can be a ridiculous film such as ‘Hot Tub Time Machine’ which worked because it was all knowing and didn’t take itself seriously, but nevertheless went with it and made us laugh. The opposite of that is say ‘Tamara Drew’. A film I knew I would hate just because Stephen Frears directed it and the French loved it. They love completely unfunny British films for some reason; it has be something they put in the subtitles I guess. Back to Inception. I completely avoided seeing any trailers. I didn’t want to know anything about it. I just wanted to be blown away and take it on its own terms without any media hoopla. Easy enough as I was in France and Spain and it wasn’t showing anywhere. As soon as I got back to England I rushed to Vue in Portsmouth and settled in. This is the cinema experience I am talking about. The anticipation is as much part of the ritual. 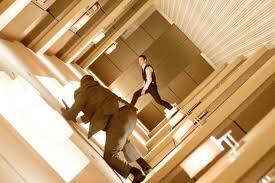 Inception was smart enough to begin with what its all about, mid-dream, mid-theft. We saw most of the important players and quickly got to know the stakes and what happens when things go wrong. We also were quickly clued in on the fragile state of Cobb’s mind (Leonardo’s character) and how flawed and desperate he is. Knowing that this is a heist movie with a difference – where dreams are hijacked for personal gain is new. No one has been here before, nor spent $200 million bucks to make it real. Cobb sees his academic father (Michael Caine) and we learn he is desperate to get his kids back and return to America, but that might be impossible because he seems to have killed his wife, their mother. Now we meet the young architect Ariadne (for classical scholars that will ring a bell, she was the bride of Dionysus and the one who spun the ball of red fleece thread that Theseus used to find his way out of the Minotaur’s lair), for everyone else it’s a complex name for a strange girl who can fold Paris over in two in the dreamworld. I like the challenges, I enjoyed the trouble the director took to get the exposition over so we could understand what we about to see, ignoring the rules about too much exposition. This was a film that needed to explain the rules of the game. If you haven’t played Inception before then you would certainly want to know the rules. This was about an experiment with the sub-conscious and even though Cobb knew that the last time he tried it it had gone very wrong, he is willing to risk himself and everyone around him to get his kids back. This we can understand. Only Ariadne suspects there is a problem with Cobb's own mental stability. Then again, there is the music. If the story of Cobb and his dead wife who taunts him from his sub-conscious doesn’t grip you, the music will. (No accident it is at Number One in the Classic FM charts). Director Nolan wouldn’t let Hans Zimmer see film rushes, so he composed the film from the script and the music was made to fit. You may hate Zimmer for his bombastic side, but here he has demonstrated genius. You try reading a script and composing such emotive music and I was struck by that incredible deep ship horn blast that sounded each time they reached the third level of the dream, crashing against the shore of the crumbling city. He extracted that blast from the script and it works perfectly to warm us of danger and signify a change in risk for the characters and us the viewer. That he also used Marion Cotillard’s theme song from La Vie en Rose and then worked the theme out using the same notes is quite significant. The music raises our emotions; the situation the characters get into is exciting, risky, tense and above all involving. Yet within the tension, the moment when Arthur (Gordon-Levitt) wraps up all the parties sharing the dream in the hotel room and fights off the baddies in a Matrix stand-off is full of humour and invention, done with wonderful Buster Keaton bathos. (Intentional or not. He shone in 'Brick' and plays the straight man here with the same dry emotion). Cross-cutting with the van they are travelling in and the many assaults upon it and even when falling perpetually in extreme slow-motion towards the river it is almost light relief and creates a nice balance between real risk, real time and actual danger. You constantly have to try to remember which dream level you are at and this is what keeps you on your toes as an audience. Yes I was initially worried that Ellen Page might not work in the architect role, but in fact, her obvious sense of concern for Cobb’s sanity and her clear delight in being able to be part of such a fantastic enterprise worked well and held many scenes together. She is nothing but gravitas and one warms to her as she realises the potential of what she has been introduced to. Tom Hardy with his many changes of face and manner kept you on alert and again he had a nice sardonic manner. Marion Cotillard’s switch between lover and she-devil was bewitching and the love between Cobb and his wife is haunting. Above all, this movie treated viewers like adults who could handle changes of pace and not have everything explained on the way. Catholics should like this movie too as it is all about guilt. I loved this film also because it was so well imagined, because you cared, because I was so thoroughly engaged and even on second viewing I was still 100% there with the characters. For me I love cinema for its capacity to take me out of my body and put me through an emotional rollercoaster. I want to feel weak and exhausted at the end of a tense movie. I want to feel as though I have been through it all and lived it and if it also impresses through music and the visual senses, then it has achieved all it has set out to do. The scenes within the dreamworld are spectacular , especially the exploding and folding Paris in the beginning and the crumbling city shore in the third level, all wonderful, challenging and each one tells a new part of the story. We all wish we could dream like that and yes dreams can be so vivid you cannot tell if it was real or not and there isn’t a soul alive wouldn’t give their all to dream so lucidly and creatively if it were possible. (The basement where people come to dream in North Africa is testament to that). Christopher Nolan by all accounts hawked this script around for ten years before he found the budget to make it and even then when show to the movie execs they hated it and wanted to shelve it. 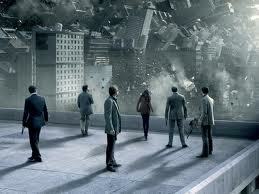 Audiences have proved them wrong as Inception has taken $622 million worldwide to date 27.08 2010. To not be emotionally engaged by Inception is to say that nothing will move you. And that’s not a good place to be at all. I note that the author Will Self 'Walking to Hollywood' in The Times today 28.08.2010 writes that Inception was 'far from being smart was, in fact, a stupid's person's idea of what an intelligent movie should be like.' This written by a man whose capacity for self-loathing are legend and his books are the very antithesis of 'entertainment'. 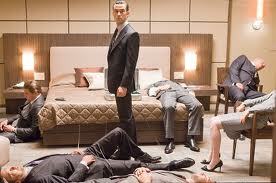 To feel superior to Inception is pathetic. Yes, we'd all love it if more films had the quality of Chinatown or Apocalyse Now but film isn't dead (as he supposes), it is changing, as it has ever done. Yes there are million other things to compete with it now and everyone is distracted, but that immersive quailty that film can bring to audiences and the fact that people do still discuss the films they see with passion means that film still matters.